Buy 1 for $19.54Buy 2 / Save $1.04!Buy 3 / Save $3.91! 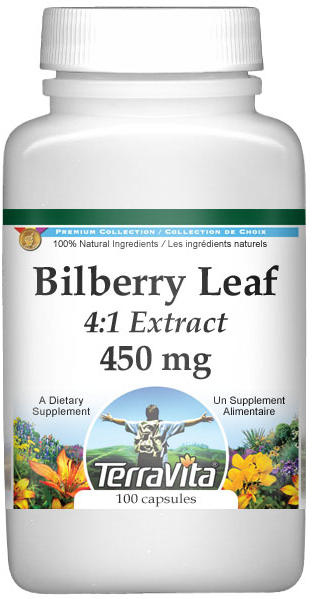 Bilberry fruits and fruit extracts are used for helping support diarrhoea, especially in children. They are used locally to help support inflammation of the mucous membranes of the mouth and throat. Traditional uses include improvement of the cardiovascular system and vision. Leaves are traditionally used to help support healthy blood sugar level concerns, joint pain, gout, poor circulation, and complaints of the digestive system, kidneys and urinary tract and externally against mucosal inflammations, dermatitis, haemorrhoids and other skin complaints. Other Names: Blueberry; airelle myrtille (French); Heidelbeere, Blaubeere (Germany); mirtillo (Italian); arandano commun (Spanish). Description: Bilberry is a common shrublet (up to 0.8 m) with small toothed leaves, white, bell-shaped flowers and purplish blue berries (8 mm diameter). Origin: Cold temperate parts of the northern hemisphere (common in Europe, but also in Asia and North America). Berries and leaves are wild-harvested. Parts Used: Dried, ripe berries (Myrtilli fructus) and to a lesser extent the leaves (Myrtilli folium). Preparation and Dosage: A daily dose of 20 - 60 g of dried berries is recommended. The leaves are no longer recommended because prolonged use seemed to have toxic side effects. Active Ingredients: The main active ingredients are mostly catechol tannins (up to 12%) and proanthocyanidins. Also present are anthocyanins, flavonoids, iridoids glycosides (asperuloside, monotropein) and phenolic acids. Similar compounds are present in the leaves. Aerial parts contain a simple bicyclic quinolizidine alkaloid, epimyrtine. Arbutin and other hydroquinones are more or less absent. Health Effects: The product reduces the levels of blood lipids and glucose; it has antimicrobial, antiviral, anti-exudative and anti-ulcus activity, can help improve the permeability of capillaries and wound-mending and inhibits platelet aggregation. These properties can be partly explained by the secondary metabolites present; clinical studies are needed to substantiate the claims. Notes: Bog bilberry (V. uliginosum) has similar phytochemicals and can be used like bilberry. Cowberry (V. vitisidaea) is rich in tannins, proanthocyanidins and arbutin. Leaves are a traditional antiseptic diuretic used to help support infections of the urinary tract. Status: Traditional health; Pharm. ; Comm. E+ (fruit only). Bilberry may interfere with iron absorption. This bilberry is like regular bilberry with a rocket launcher.